Saturday morning is my favorite time of the week: I roll out of bed around 9, walk or bike down to the Grandin Farmers Market, chat with the farmers, bag some wonderful produce, pick up necessities at the Co-op, walk/bike home, make some coffee, cook up a tasty brunch while listening to bluegrass or folk on Pandora, and catch up on blogs. There’s nothing like it. This morning I didn’t need to buy any produce–I still have cabbage, an eggplant, and green beans left over from last week–but the market called and I couldn’t not respond. It’s addicting like that (smile). I had some poblano peppers left over from the other week so I decided that brunch would be sausage stuffed chiles rellenos with a tofu scramble. At the market I picked up some habaneros and peaches, so peach habanero salsa was the obvious accoutrement for brunch. $9 later (two habaneros, 4 brussels sprouts plants that I’m going to plant!, one bunch of parsley, 4 peaches, 1 block of tofu, and 1 can of black beans) I walked back home sipping my coffee and watching the birds flit from oak to oak. This neighborhood is just so peaceful and leafy. Raking is going to be a pain in the a#$ though. But for now it’s still summery and green, so I’m going to enjoy it while I can. 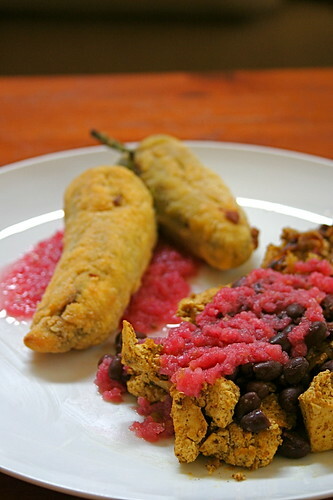 Making the chiles rellenos was easier than I thought it would be. I simply broiled them for a few minutes on each side in the oven, let them steam in a plastic bag, skinned them, stuffed them with browned homemade soysage, triple battered them, and fried them up. Delicious! Stuffed peppers are the jam. The salsa was whipped up in a matter of seconds and the tofu scramble was normal, just with chili powder mixed in in addition to the normal spice mix I use. Spicy, bitter, acidic, and fruity, the brunch was just what I needed after I semi-stressful week. Now to plant the brussels sprouts! My first foray into veggie gardening! Wash the poblano peppers and place on a baking dish in an oven set to broil. Let broil for 3-4 minutes, until the skins have blackened, flip over, and broil for 2-3 more minutes (until blackened). Remove from oven, place in a plastic bag, and let steam for 10 minutes. Meanwhile, bring a small pot of water to boil. Cut an “x” into the bottom of the tomato. Once the water is boiling, drop the tomato in the water and blanch for 15 seconds or so (the skin will start to peel off). Remove, set aside to cool. Drop the peach into the water for 30-45 seconds. Remove and set aside to cool. Peel the tomato and peach. Put in a blender with the onions and 1/2 habanero pepper (be careful not to get the habanero juice on your hands, it will burn). Pulse until blended completely. Set aside. Once the poblano peppers have steamed, remove from the bag. Heat 1/4 cup of vegetable oil in a small saucepan. Scrape off the blackened skins of the poblanos with a knife. Slit down one side. Fill each pepper with 1 tbsp of browned soy sausage. In one bowl, whip together the En-R-G egg replacer with the water till stiff. In another bowl, place the corn flour. For each poblano pepper, place it in the egg replacer mixture and coat evenly with the mixture. Then dredge in corn flour, cover completely. Repeat the process 2 more times, until the pepper has a thick crust of egg replacer and corn flour on it. Fry in the oil for 2-3 minutes on each side, until slightly browned. Let cool. Serve with the salsa and tofu scramble of choice. Oooh, I saw that you bought 2 habaneros and couldn’t WAIT to see how much salsa you ended up with! What’s on the agenda for the other 1.5? I’d add them to about 4 cups of (dry) pintos & put the slow cooker going with 12 cups of water & a couple of chopped onions, but that’s just me. That’s such a good idea! I’d been planning on making a big ol’ pot of beans to make it through the week till my loan is disbursed & I wasn’t sure what to make. mmm habanero beans! Totally! Tomorrow’s the bean-making day for me – it’s too late in the evening to contemplate picking through to make sure there are no cracked ones. Yum! I’m totally with you on the student-loan waiting thing, too. We didn’t go home this summer … but will have money for it around Christmas, hopefully! Looks amazing, and I’ve been wondering what to do with all these peaches: adding habanero to them is a great idea! These looks very tasty! Yum! The chiles look very delicious. The salsa sounds wonderful, too. How I wish we had a decent farmers market here. That looks like a power brunch, Jes. I have plenty of habaneros, so I will have to give that peach salsa a try. I see we both of chilies on the brain. I absolutely LOVE chile rellenos (I actually have a tattoo of a poblano pepper), but haven’t thought about them much since I always regarded them as a strictly non-vegan item. Thank you for proving me wrong. Mmm… I had a friend over friday night so after returning from Farmer’s Market on Sat I ushered Mr. Guava back to bed and made them both a mexican inspired brunch too!!! Black beans, potatoes, fu scramble, homemade guac, and pico de gallo with raw corn!! YUM! Peach Salsa looks sooooo good! BRUNCHES are the BEST! That sounds so spicy delicious! Your batter worked beautifully. pandora is the best! dan introduced me to it a while ago and i love it the most! they have some great surf music that i listen to a lot! w00t! i need to find some good bluegrass & folk, too! farmer’s market fun & cooking are glorious saturday traditions for us as well! yay! peaches are so delicious, i never would have thought to make a peach ‘n habanero salsa! mmmmmmmmm! too funny on raking leaves – dan abhors it, for me – it’s one of my favorite late fall/early winter activities. i think it’s because we live near the woods so it’s easy for me to rake all our leaves on a tarp & pull them into the woods to compost. easy peasy! hooray for growing brussels – they’re my favorite veggie! i’ll be making your chili rellenos, Jes – i’ve never made them before and they sound tasty & easy & oh-so awesome! w00t!